The October-November Western Angler takes a look at the great fishing on offer around Exmouth. One of the world’s best sportfishing destinations, Exmouth has something for most anglers. 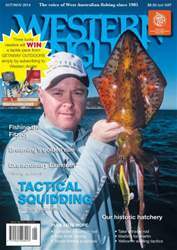 Scott Coghlan also looks at his favourite colour selection for bream fishing, while Peter Anderton offers his tips for successful squidding. Ashleigh Boyce gives the good oil on catching trophy barramundi at the Fitzroy River, while Monica Mumme details the rich history of the Pemberton Trout Hatchery. Darryl Hitchen puts the impressive Tattoo 485 Abalone through its paces. There’s also plenty more including a look at the new custom rods, shore fishing surprises, tips for catching yellowfin whiting and a detailed how-to for the Homer Rhode Loop knot.